Fabric tension structures, also known as tensile membrane structures, are unique pieces of architecture that add to the functionality and aesthetics of a commercial property. From architectural umbrellas for strategic shade to indoor/outdoor spaces that create the best of both worlds, these structures are versatile and beautiful. However, just like with traditional construction, fabric tension structures require expertise to ensure the designs are efficient and safe. As a design-build specialty contractor, the team at Tension Structures uses a four-stage process to ensure the project exceeds your expectations. After working with our design team to channel your imagination and transform your thoughts into a visual concept, the engineering team begins its work to ensure the design is efficient, feasible, and meets the required design load criteria. During this stage, we develop the certified engineered drawings required by the permitting authorities and the detailed shop drawings, which guide the manufacturing of the steel members and the fabrication of the PVC or PTFE-coated fiberglass membrane. During the engineering analysis, we determine the optimum sizes for the steel, cables, and fabric elements. This means considering all structural aspects of the design, such as (but certainly not limited to) the wind and snow load criteria for the project location, the final reaction loads for the concrete foundations, and the fabric patterning of the membranes to ensure it’s installed with the proper pretension. 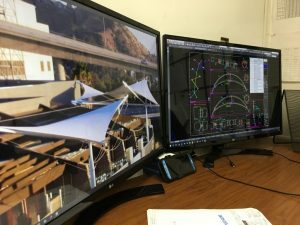 Whether you are looking to create unique and iconic fabric tension structures or purely functional ones, our team partners with your architects, landscape architects, general contractors, and management team to ensure the best-suited plans to meet the project goals and performance requirements. We blend our specialized construction expertise with our extensive knowledge of structural requirements across the country, so that your project can continue to move forward without concerns about unexpected obstacles. Finite Element Analysis (FEA) to determine reaction forces of the structure under simulated loads such as the wind, gravity, and pretension of cables. Engineering calculations to ensure the structure is suitable for the loads in your city – whether it’s 115MPH Santa Ana winds in California, 180MPH hurricane winds in Florida, or 50LB snow loads in Syracuse NY. Design and calculation of appropriate concrete footing sizes. Optimization of frame structure member sizing and anchoring. Precise fabric patterning of the tension structure membranes to ensure a tight and wrinkle free fit. Certified Engineering drawings and calculations suitable for state and local permitting authorities. Detailed and approved shop drawings for manufacturing. Whether it’s a permanent durable PTFE membrane canopy or deployable flexible PVC fabric structure, Tension Structures by Eide Industries will help you discover new solutions to conventional design challenges. For a closer look into our four-stage design/build process, click here. 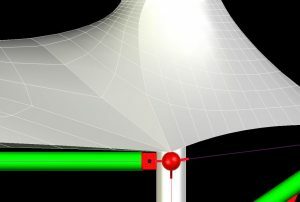 Are Fabric Tension Structures Right for Your Next Project? In the Tension Structures Division of Eide Industries, we specialize in design, engineering, manufacturing, and installation of structurally complex and creatively challenging commercial, government, and prototype design projects. We provide expertise and support for architects, landscape designers, general contractors, and property owners to develop their custom tensile membrane project ideas and construct iconic structures. Explore the options for your next project. Contact one of our experts today by calling 800-422-6827. At Tension Structures, we specialize in design, engineering, manufacturing, and installation of structurally complex and creatively challenging commercial, government, and prototype design projects. Explore the options for your next project. Contact one of our experts today! © 2019 Tension Structures, a division of Eide Industries, Inc. All Rights Reserved.